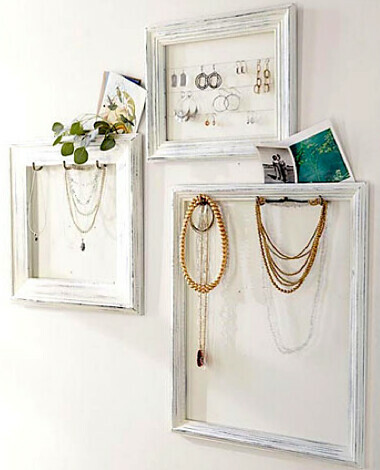 After seeing this pretty photo on Lauren Conrad's Blog, I was feeling all inspired as to creative jewellery storage! I am about to start decorating our bedroom (not literally, but in the next month or so) and I'm trying to organise all of my ideas so I know what to buy and what I want, so I don't end up going crazy mad with spending. As the rest of the room will be the standard 'off-white' colour, I've been trying to think of ideas which will fill up the wall space without it looking too much or conflicting with the wallpaper, and the above photo totally inspired me! Whilst I don't have huge amounts of jewellery, I think that displaying the prettier pieces is such a great idea, and it will definitely add more to my make up area. 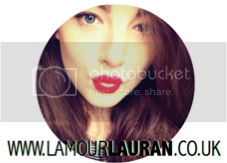 Taking direct inspiration from the photograph, using photo frames. A lot of jewellery on the high street is so decorative in its own right, so why hide it away right? They are there own little art pieces! This frame would definitely fit the theme of our room. Dotting decorative knobs or hooks on the wall, to hang pretty necklaces on. I think that this would look so cute, and definitely unusual. This may be an idea that I carry to my bathroom if it looks too much in the bedroom, as I could hang towels on them etc. Using a pretty bowl to show off some rings and bangles. I see this a lot when I watch/read dressing table videos/blogs and I always think it looks so effective and plus its practical! You can see exactly what you've got and is great for someone like me, who constantly leaves things out!